The past three weeks or so I just haven't been biking. Well biking with the little guy. See I am currently 15 weeks pregnant and my growing stomach just didn't like the discomfort of a front mounted seat. And to be honest weight wise M was technically out growing it. We have been relying on walking and public transportation, which like any method has its drawbacks. Aka me waiting for late buses. Dislike. After stalking eBay for the past two months (I knew the front seats days were numbered) I have finally nabbed a Yepp backseat for a great price!! Cue excitement that M and I will not solely be relying on the buses. Also cue me being sad he won't be between my arms anymore when we bike. I'll be back on Wednesday with our cold weather plan for the little guy. 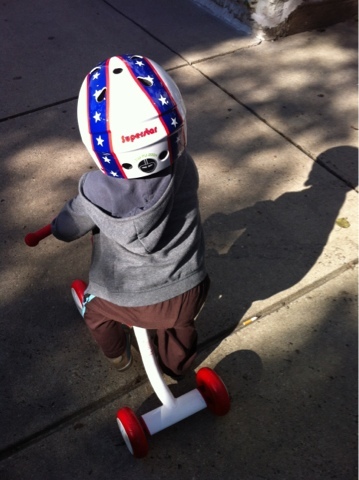 Until the bike seat gets here M will cruise around on his balance trike.